Our patented Helical Pier System permanently stabilizes your home’s foundation and is manufactured and engineered to perform. Using small construction equipment, the ECP helical piers are mechanically “drilled” through the shifting soil to a stable, load-bearing strata. After the installation has reached the specified depth and verified capacity, a steel foundation bracket is connected to the ECP helical pier and your home’s foundation. ECP’s helical piers come with an industry leading 25-year warranty. Contact one of our certified independent contractors by clicking here. ECP’s 150 round corner square bar (RCSB) is the VERY BEST in the industry. ECP’s 150 is a 1-1/2” diameter RCSB that has a 7,000 Ft Lbs torque rating and an ultimate capacity of 70,000 lbs. ECP’s 288 helical pier is a 2-7/8” diameter tube with a .262 wall thickness. They have a 9,500 ft•lbs torque rating and an ultimate capacity of 100,000 lbs. ECP makes the VERY BEST helical piers in the industry. ECP’s 288L helical pier is they VERY BEST in the industry. ECP’s 288L is a 2-7/8” diameter tube with a .203 wall thickness. The 288L has a 5,500 ft•lbs torque rating and an ultimate capacity 60,000 lbs. 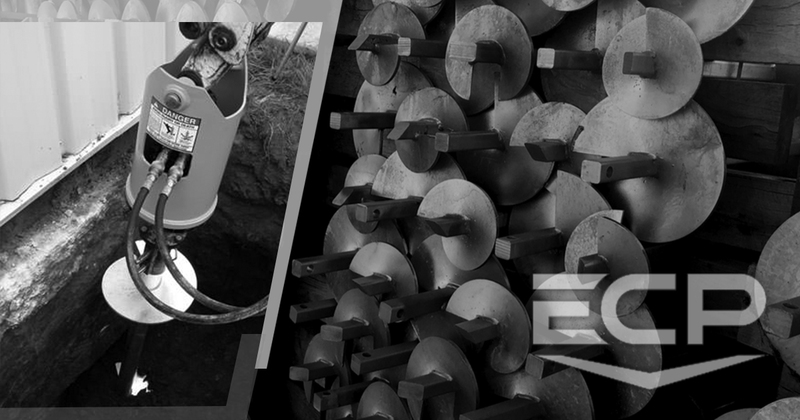 ECP’s 175 is a 1-3/4” diameter round corner square bar (RCSB) that is the VERY BEST in the industry. ECP’s 175 has a torque rating of 11,000 ft•lbs and an ultimate capacity of 100,000 lbs. ECP’s 350 helical pier is the VERY BEST in the industry. ECP’s 350 helical is a 3.5” diameter tube with a .300 wall thickness. ECP’s 350 has a torque rating of 13,000 ft•lbs and an ultimate capacity of 120,000 lbs.